The South Island has been under siege from the North West wind since the 2013/14 season began at the start of October. As a consequence, the rain on the West Coast h as continually topped up our braided rivers in Canterbury. Warnings for rising river levels in the foothills of the Canterbury rivers are a regular occurence. If you are like me, you will be looking forward to casting some zed spinners into some likely holding water. When these winds subside your salmon gear should be taken out of the cupboard, dusted off and used to target an early season salmon. In my opinion the November run on the Rakaia River was the best consistent run of the entire season last year and I believe the signs are there that this is going to be another bumper season. The first sign I look for when forecasting what the upcoming season is going to be like is how prolific the catches were for the whitebaiters. Both salmon and whitebait spend a portion of their life at sea and in my experience the catches of these two species seem to mirror each other through both plentiful and poor seasons. They both have to experience the same harsh marine conditions such as temperature and food availability which can have a detrimental effect on fish stocks. This year a substantial amount of bait has been caught on both the East and West Coast with baiters saying it was the best opening day in years. 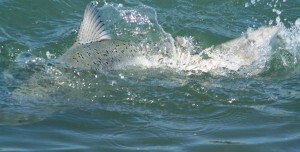 This all looks promising for a successful salmon season in 2013/14. The fish returning this season will have dined out on two years of having an abundance of krill out at sea. Red krill is the main food source for salmon and research suggests that the presence of or absence of krill plays the major part determining the size a salmon is able to attain at sea. Last season there were many fish caught in excess of 20 pounds and some into the 30 pounds being caught or lost. My prediction based on the amount of food at sea is the fish returning this season will once again be large. Traditionally the early run in November sees many of these bigger fish begin their upstream migration. As I write this article in October, I already know of salmon that have been caught on lure rods from the Rakaia River earlier in the month before the floods. My advice to everyone is to have your fishing gear ready to go as soon as the rivers start to reside. The fish will be encouraged into the braided rivers with these conditions and there is nothing like getting the monkey off your back with an early salmon.